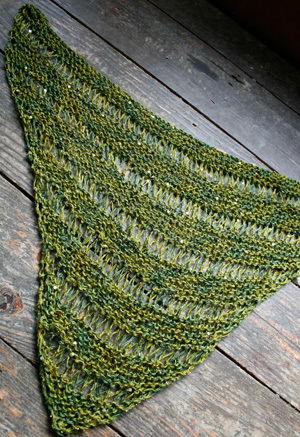 Free Knitting Pattern for Nefertiti Shawlette, Scarf or larger shawl version! 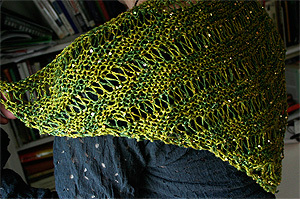 1 skein makes this shawlette - approx 27" across the top and 15" long! Use 2 skeins for a full fledged shawl. Suggested yarns: Artyarns Beaded Silk and Sequins Light or Beaded Silk Light but can be done in any yarn - shows off embellished yarns especially well! Very simple faux lace created by alternating panels of garter stitch and single row of elongated stitches created with yarnovers - very simple. This pattern creates a small piece with one skein, but can be doubled by using two skeins. The width is increased by using yarnovers at the beginning of every row. Join our elist and Download the Nefertiti Shawlette Pattern!